I'm Khalil Khalilian, Character TD, recently I started working with awesome plugin Ziva Dynamic and now I created this discussion for sharing some of my WIP to yours and asking some question . all modeling credit is to Ghasem Mollahasani and animate to Hamed Behrouzi. i would greatly appreciate it if you kindly give me some suggestion and feedback on this. As I mentioned to you privately, the muscles seem free to move and do their thing. Good sense of weight to the character. Line of action firing is coming and going nicely. I think you'd benefit from having a volume that represents the abdominals and internal organs. You can see that those objects go up and under, and attach onto the pelvis. So about your first feedback I want say, I made body like a real photo of the bull, And I think I can't move down abdomen more then this! it is right? Please let me know I must add sartorius? 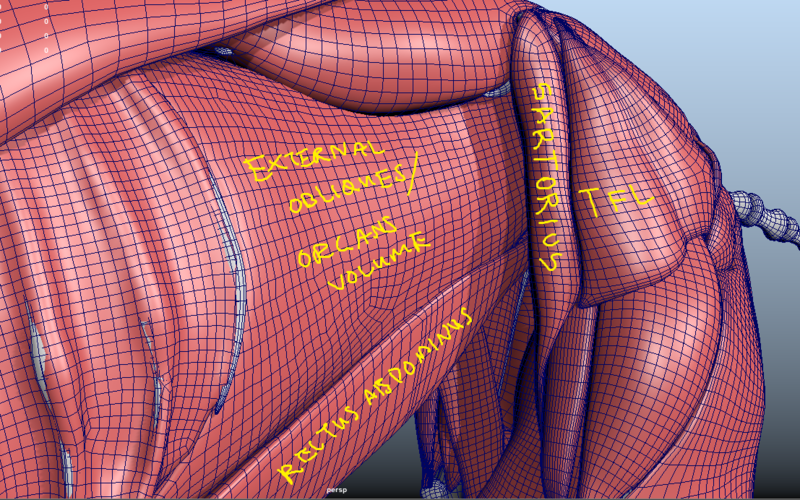 And about abdomen I must separate this to 2 part (Rectus and orcans)? Hi Ghasem, absolutely up to you, and the requirements of the project as to what level of fidelity you're faithful to the anatomy. 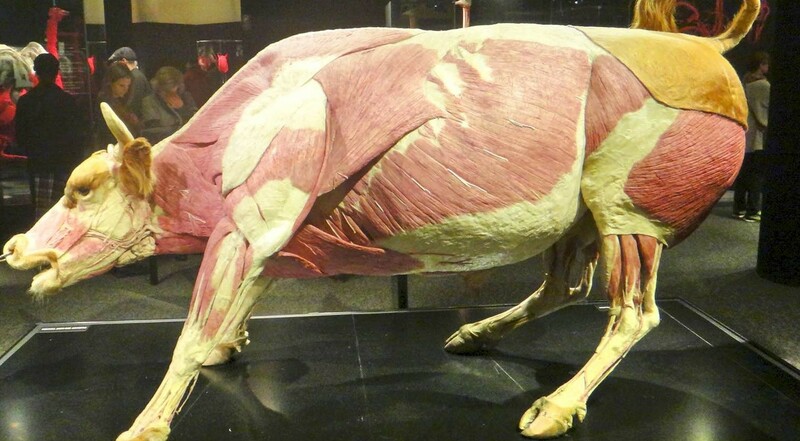 A bull will have a sartorius, even if it's not as pronounced as in other animals. 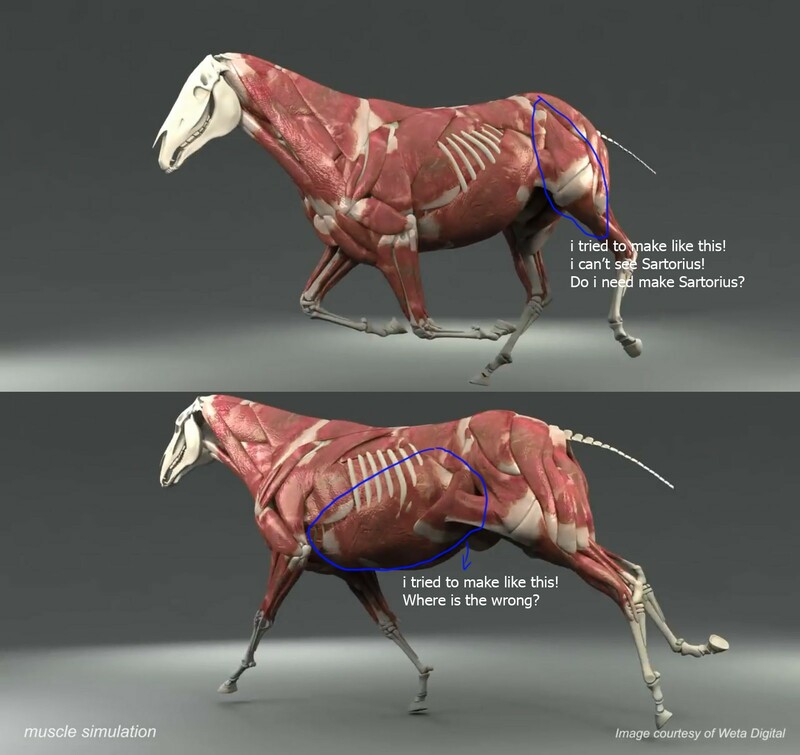 As for the tissue that goes between the obliques and the upper leg muscles (on the image you circled); as far as I can tell, there isn't actually a muscle here. I had it in the lion initially because it was convenient but took it out in the end. Instead it was solved as cloth as part of the fascia. As for the second image, the tissue you've circled should run all all the way back and attach to the pelvis. In your bull it stops at the legs. This is a walk cycle for Bull.This animate isn't final version,if you have any comments please tell me. 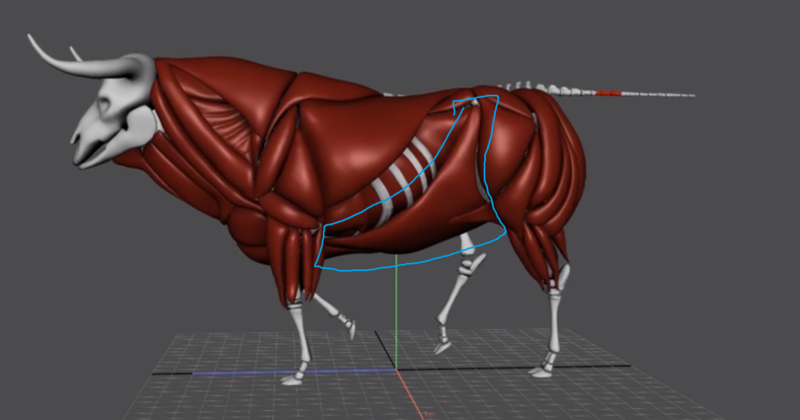 This is quite a tough animation, not to be discouraging, but I would honestly start again, and focus on getting the gait right, from there you can then layer in the hips and chest while adjusting the gait and we can really focus on heavy realistic walk. Find some solid reference of a bull or cow. Here are some variations on youtube. 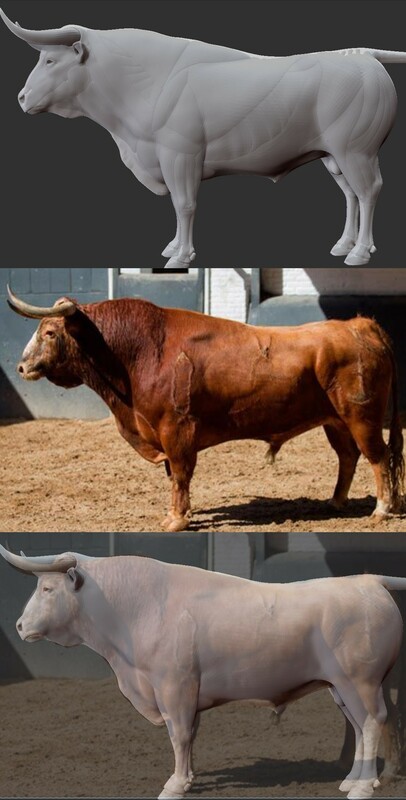 In your animation there are points where the bull has three legs off the ground, this combined with soft landing of the feet doesn't convey the weight of these majestic creatures. Once you have legs right the rest will be easier to work with. Look forward to seeing a new first pass and helping you out with this. you can see our final muscle pass. 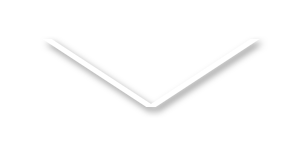 I'm looking forward to seeing the next iteration. really niiice!! Keep up khalil! I have some question about LOA , "acc sensitivity" and "vel sensitivity"
when I must use them and for which muscles? Andy ,in your lion project did you use of them ? I didn't use acceleration or velocity for lion of action for the lion. For example if you were to bend your arm just a little bit, but very quickly, the bicep would contract a lot to do this work. In this case you can try velocity or acceleration sensitivity. Congratulations to Ziva team for their good eye detail. andy_vs I'm working on that and in next week I'm going to make some surprise for you...! Looking forward to see fat and skin pass. khalil66 Can you share how you got this awesome wrinkles? 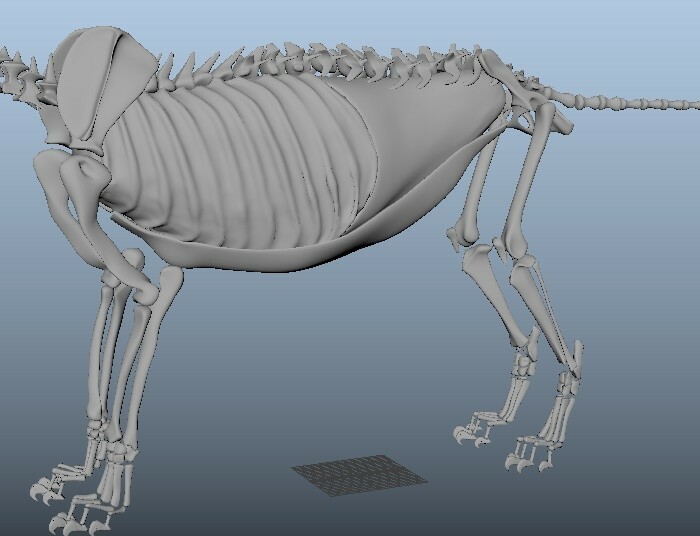 for this wrinkles I used Zcloth ,combining slide and fix attachments like Andy's lion with weaken stiffness around 104 and high poly mesh for fascia . but I'm waiting for what would Andy say about my fascia,because I think this wrinkles in fascia pass is incorrect and probably there must be in skin pass in last step . awesome work. something you might want to consider. quadrupeds breathing is part of their locomotion, when when they compress they exhale. right now on your animation, the ribs are static. if you add breathing coinciding with the long stride (inhale, expand ribs) and on the short strides (exhale, compress the ribs.) might help sell it for ya since the ribs are currently holding still and drawing my eye. nice work regardless! Thank you for your comment, honestly my base rig from the beginning had breathing feature and Hamed (my animator) used it in his animate,but when breath and walk movment combined together we don't see breathing clearly and I think it's normal in real world, because breathing movment is very small part of whole the walk movment.